Sometimes kids just need kid-sized stuff. Kid-sized food, kid-sized clothes, and even kid-sized furniture. 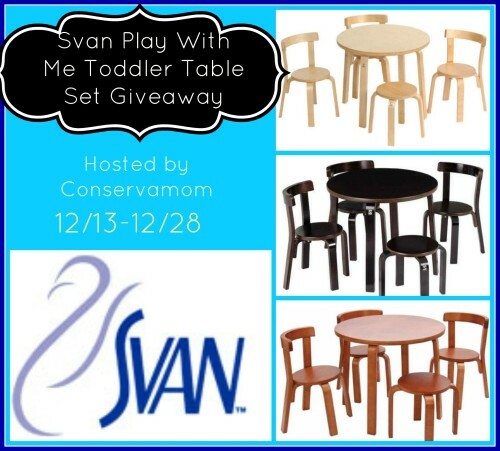 Svan's Play-With-Me Toddler Table & Chairs is the perfect size for your child, and designed to promote child and parent interaction. The set includes a beautiful bentwood table, three chairs for children, and a stool sturdy enough for Mom or Dad to join the fun. Crafted of high-quality, solid birch wood, this table set is built to stand the tests of time and kid use – art projects, tea parties, games, and other activities. 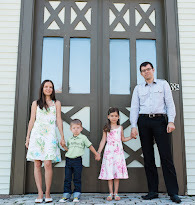 Its modern Scandinavian design complements any décor – from a bedroom or playroom to the living room or home office. This set is the perfect addition to any kids furniture collection. To find out more about this gorgeous set you can check out Conservamoms review here. Thanks to the wonderful people at Svan you have an opportunity to win one of these sets. In your choice finish! Just fill out the rafflecopter below for your chance to win. Giveaway ends on 12/28 at 11:59pm. Open to US & Canada. I love the cherry finish. I like the natural the best. My favorite is the Cherry color finish. I like the set in Cherry. i like the natural color! My fav is the black set. I like Espesso the most. Espresso is my favorite color for tthe table set. My favorite is the natural wood set. I like the cherry set. The design of this play set is so beautiful that I think it looks good in all colors, if I had to pick I would say Cherry. i love the dark hard wood!! I prefer the natural wood!